Cocktail Hour from 6:30–7:30 p.m. Seated Dinner and Dessert from 7:30–8:30 p.m. The 2014 Alva P. Loiselle Tournament’s Final Arguments took place April 17, 2014. Judge Richard A. Robinson of the Connecticut Supreme Court, Judge Robert E. Beach of the Connecticut Supreme Court, and Judge Jose A. Suarez of the Connecticut Superior Court presided over the final arguments and eventually declared 1Ls Megan Wade and Alexis Beyerlein as the Loiselle Champions. 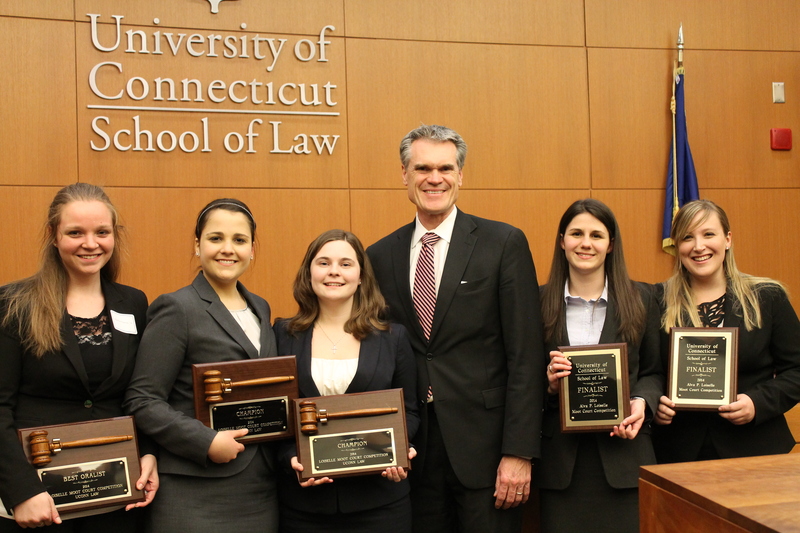 The Alva P. Loiselle Moot Court Tournament is a longstanding tradition at the University of Connecticut School of Law. It allows students to hone their oral argument and team work skills and provides them with the opportunity to earn an invitation for membership on the Moot Court Board. This year’s issue, Wood v. Moss, involved a First Amendment viewpoint discrimination claim against Secret Service agents brought by a group of anti-Bush protestors who were moved by the Secret Service while protesting outside a restaurant in which the former president was dining. Molly Smith and Abigail Bellafatto argued that the Secret Service did not violate the constitutional rights of protestors by moving them outside of an impromptu buffer zone, necessitated by the sudden change of plans by President Bush. Alexis Beyerlein and Megan Wade argued that the protestors were moved because of their anti-Bush views, making the act of moving them a clear violation of their First Amendment rights. Both teams made good use of their allotted time, presented compelling arguments, and provided meaningful answers to all questions posed to them by the judicial panel. While the judges deliberated, the Moot Court Board extended their invitations to membership to the chosen competitors. Offers were first extended to the finalists: Alexis Beyerlein, Megan Wade, Abigail Bellfatto, and Molly Smith. The award for best oralist and concomitant invitation to membership was awarded to Nina Pelc-Fasczcza. Further invitations were extended to: Kate Peccerillo, Courtney Gardner, Daniel Spruill, Samuel Lisi, Alexandra Rotondo, Thomas Holmgren, Lauren Denault, Ashley Membrino, Jane Kelleher, Alexandra Crean, Breana Vessichio, Kelsey Bond, Joe Gasser, and Chris Stanton. Congratulations to all of the new members of the Moot Court Board. Afterwards the competitors, Moot Court Board members and attendees adjourned to The Butterfly for chinese food and karaoke. Any students interested in joining the Moot Court Board or who would like to compete in the future should look forward to the William H. Hastie competition next fall, which involves solo oral arguments and the option to submit a written brief. Wednesday, April 2nd to Tuesday, April 8th; 12pm to 6pm. transportation, buffet dinner, dancing and photo booth. New data shows that the job market for law grads has not improved to pre-Recession levels, but it is no longer contracting. Employment prospects have been hampered by a glut of new graduates. In a country where there are roughly twice as many law graduates as there are job openings, many graduates have been left unemployed or in part-time work. However, the ratio of graduates to available jobs varies depending on at which state you look. Some states, such as Vermont and Massachusetts, produce vastly more graduates than they have job openings. Other states, such as Nevada or Utah, appear to have a far less dire situation, with roughly as many graduates as they have job openings. Alaska, which does not have a law school and imports all of its lawyers, is another state in which there is less of a glut. Connecticut, with roughly 2.7 law graduates for every job opening, is roughly the 10th most glutted legal market in the country. In this market, many law graduates have turned to part-time work. The rate of lawyers who resort to this has exploded over the past few years, with an enormous growth in part-time work in several New England states. The legal market may also be changing on more fundamental levels. According to some analysts, growth in the largest law firms may continue to stagnate, with more innovation being driven by smaller, specialist law firms. While the biggest law firms do continue to grow, their growth rate has slowed, and their expansion is often fueled more by lateral hires than law school hires. The demand for legal services contracted slightly during 2013, but there was some growth in areas like real estate and employment law. The recession also has encouraged many companies to reduce expenses by bringing more legal services in-house, a move that may hurt law firms but makes in-house legal work a bright spot for legal hiring. The state of the legal job market may be causing a drop in applicants to law schools nationwide. Several law schools have slashed the size of their incoming 1L classes, and some have lowered tuition in an effort to attract increasingly cautious applicants.